Provide The Best For Your Child - Babyproof Your House & Make Sure That Your Little Angel Will Stay Safe & Sound! Are you worried about your curious toddler as he/she keeps exploring the house, coming in touch with rather dangerous objects like knives and scissors? Do you often wish that you would not have to clean after the mess your little ones create in the kitchen? Don’t Worry! Now you have the solution. Meet The Safety Locks By Wappa & Enjoy Staying At Home With Your Baby Carefree! This great pack includes 10 flexible safety straps that will promise to take the best care of your baby and make your life so much easier. Installing these safety latches on cabinets and drawers will keep children away from potentially poisonous or dangerous household products. This way, you can rest assured that your child is safe, without panicking every time you see them opening a cupboard! A Must Have For Busy Parents Who Want Their Children Happy & Their House Neatly Organized! As a parent yourself, you probably know how curious your baby can be. With these safety straps you don’t have to chase them around the house all day long, trying to stop them from touching any dangerous item! Having secured what your child should not reach, you won’t have to tidy up the whole house that your little explorer will possible overrun! And as these locks do not need any drilling, you can also make sure that none of your furniture will be destroyed! What Are You Waiting For? Don’t Squander It – Place Your Order Now! SAFETY COMES FIRST: When your little ones start taking their first steps, you know it's time to make your house a safe environment for them. With these smart safety locks you can effectively protect your child from choking hazard or from accessing any dangerous household items, like chemical cleaners, medicines, sharp objects or various appliances. MULTI - PURPOSE SAFETY STRAPS WITH DOZENS USES: Make sure that your baby or toddler is safe by securing cabinets, appliances, drawers, refrigerator, trash bin, toilet seat and more. With these amazing locks you can also keep your stuff neatly organized as your curious child cannot reach it! Use them to secure your wardrobes or storage cupboards and save yourself time from tidying up! THOUGHTFUL DESIGN: These safety straps are made to serve the person who uses them! Not only do they have adjustable length from 7.5" to 4.5" but they are also flexible to maximize their use. They work perfectly on both flat surfaces and round corners. SUPER EASY TO INSTALL: With these great straps you can make your home childproof hassle free! Thanks to the adhesive strong industrial grade 3M tape they have on both sides, you can install and remove them within seconds. No drilling or any special tools needed! And don't worry about your furniture, these straps leave no residue and won't cause any damage to it! 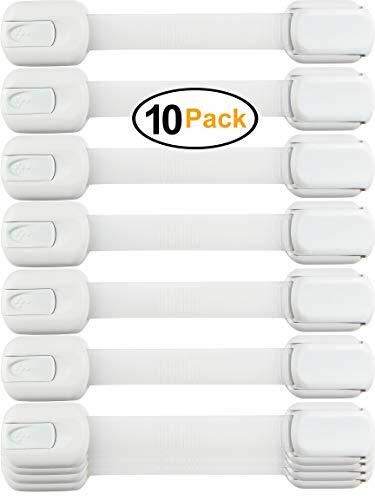 VALUE PACK OF 10 SAFETY LOCKS: Why buying 5-6 straps when you can have a set of 10 high quality locks? With these straps by Wappa you can secure 10 different surfaces at once! Our product comes with 4 extra 3m tape, instructions, insert card and 4 outlet covers.